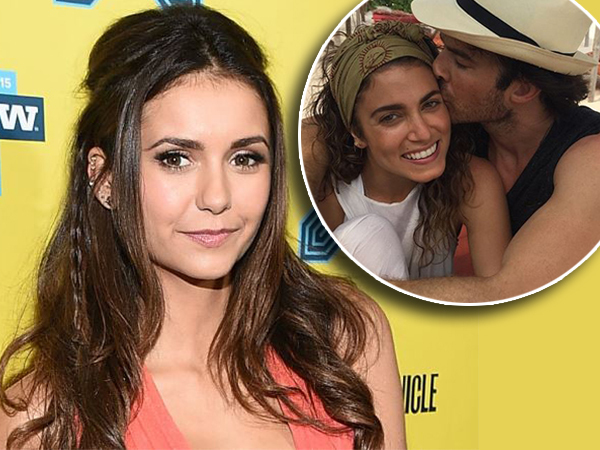 Nina Dobrev is so “happy” her ex-boyfriend Ian Somerhalder married Nikki Reed. Nina and Ian began dating in 2010 while filming their TV show The Vampire Diaries, but they ended the relationship in May 2013. In mid-2014 Ian sparked up a romance with Twilight actress Nikki Reed, with the pair having tied the knot on April 26 in Malibu, California, and Nina couldn’t be happier for the newlyweds. "When I heard about the wedding, I thought it was beautiful. They look happy and I am happy and so I don't see why there should be a problem with that,” she told E! News. “The drama is in the media, it's not with us. But of course, we're on a teen drama show, everyone's going to look for drama. If there's no drama, there's nothing to write about. I just ignore it." In April Nina announced she’ll be leaving The Vampire Diaries after spending six seasons on the show. Salty...sandy...sticky...sunburned. The best. I love this human. My human. Although speculation is rife she is parting ways with the programme because of Ian, the 26-year-old actress claims this couldn’t be farther from the truth. "I've said this before, that we didn't break up because anything bad happened or because there wasn't love or friendship," Nina said. "I love him and the friendship is still strong and I think he's great and I care about him. And that didn't change. Yes, we're professional and that's fine. We were friends long before we dated and we still are now."